Two weeks ago I came home to a circus. Mica built his own circus in his room. There was a sign taped to the floor outside his bedroom door. It said the time of when the circus started. I came too late, but he let me see it anyhow. 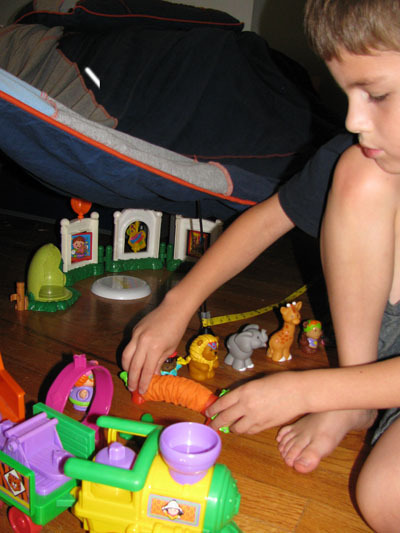 The Fisher Price Little People that I stashed away, the boys got out once again. I put them away because they weren't playing with them; only to find out that they want to play with them once again. Mica's bed was draped over like a circus tent. Isaak's toy tape measure was a tight rope. 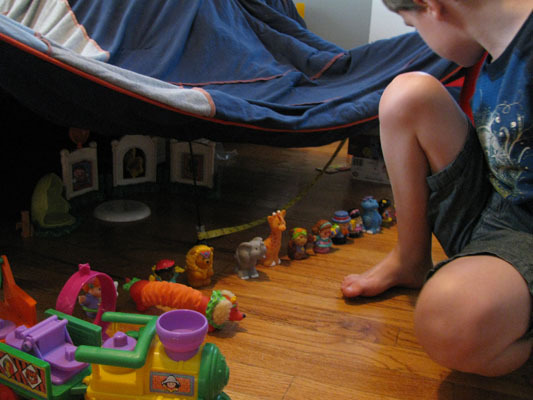 Little People and animals were lined up for the show. Then he had a Madagascar canon that went off. It reminded me of the artist Alexander Calder's Circus made in 1927. If you do not know who he is, he discovered the mobile. He had a miniature traveling circus that he'd perform in front of people. You can see it here if you'd like. That looks like it was a lot of fun. Mica has quite the imagination doesn't he?? Good for him!! How cute that you got to see his liitle circus. Ha ha ha I love it! That is so fun. I love Mica's circus. I miss the days of Little People. Now it's all about video games! Very creative! Mica certainly did a great job. My kids loved the Little People. Mica sure seems to love them too! Ok that is just awesome! Love those creative young minds! He did a great job! Happy Wednesday! I love how their huge imaginations work! Aww! that is quite cute heheh! Aww so cute. I love kids and their imagination! what a great imagination! thanks for visiting and linking up with me on WW! thanks for coming by ~ always love to have you visit! That is so creative and adorable! Birthday Party, Cheese Cake, Jelly Bean, BOOM! My Children Look Like Which Celebrity? Guess Who Picked Up the Backstroke This Weekend?